When a language group hears the Scriptures in their own language for the first time, they respond enthusiastically. Why? Because it sounds good from the youngest to the oldest, the deep meaning of their heart language makes the Scriptures stand out and the result is changed lives and transformed communities. 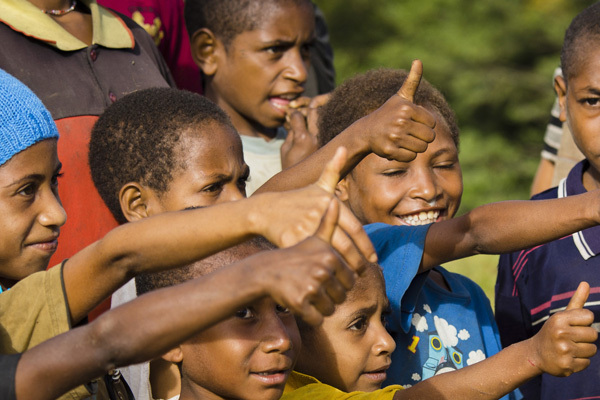 Pray for language groups throughout Papua New Guinea who are hearing the translated Bible for the first time. Pray that projects could be started soon in the almost 300 remaining languages that need them. How do you grow vegetables in the jungles of Papua New Guinea? You need to clear a space and that requires a lot of hard work. 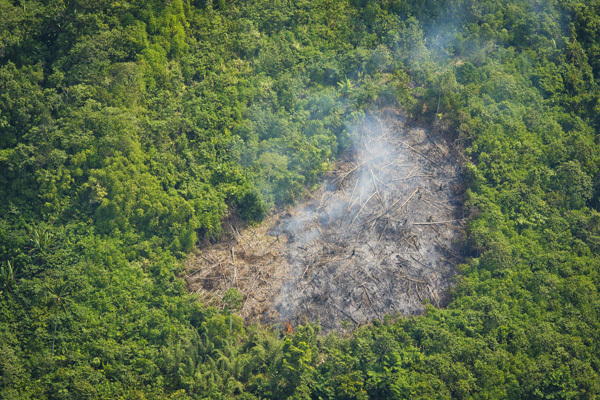 An area is cleared of trees and then the thick brush is burned. Small drainage channels are made because of the frequent and heavy rains and then you are ready to plant. A lot of work occurs before you even think about putting something in the ground. So it is with translation work. Sometimes years of preparation are required in order to get to a place where you can get even one small book translated. It takes perseverance and hard work before the fruit can be seen on the vine. Pray for the language workers and Bible translators working in approximately 200 languages in PNG. Pray for patience and success. 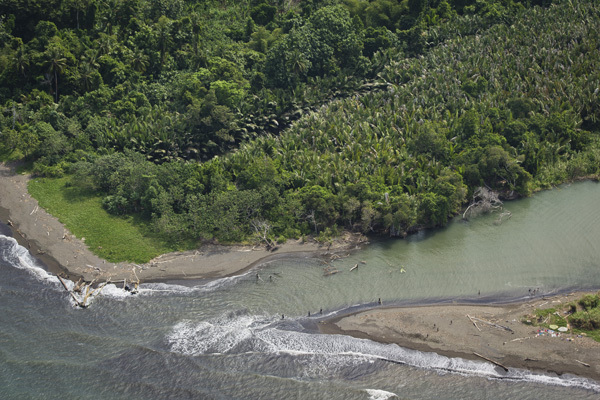 There are many coastal villages in Papua New Guinea. Living on the beach has many advantages – close to good fishing, cool breezes from the ocean provide relief from the hot tropical sun and who wouldn’t want the view! However, PNG is in an area of frequent and powerful earthquakes. Earthquakes under the sea can cause tsunamis that can wipe out a village in seconds. In the summer of 1998, three 30 foot waves overwhelmed the village of Arop where the death toll for it and surrounding villages exceeded over 2000 people. At the time, Arop was in the midst of a Bible translation project. While the disaster was extensive, a new project resulted in a transformed vision for a multiple language project that included their language group and several others. 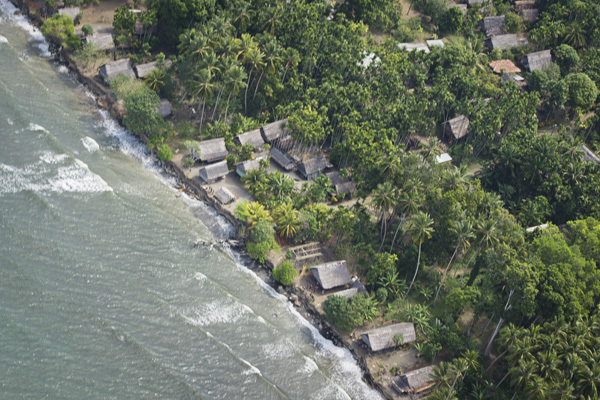 Pray that these villages would be protected from the sea and that Bible translation could be completed in the eleven language groups now participating in a cluster project in that area. 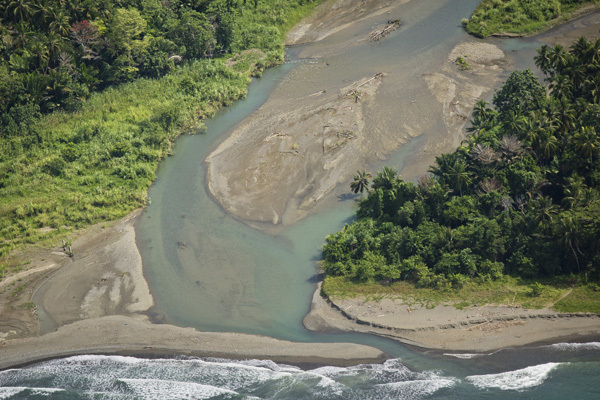 Life is full of give and take… like this river as it meets the sea. The waves pound the salty water up stream while the relentless current of the river pushes the fresh water into the ocean. Which will win? As you know neither and the result is a mix of salt and fresh water. If you look closely, you can see four fisherman on the bank. Why? Because in the mix there is great fishing. When working with different cultures sometimes it feels like two ideas are pounding into each other with no good results. However, if time is taken to see the advantages of both, often the two ideas coalesce into one better idea and the result is success. 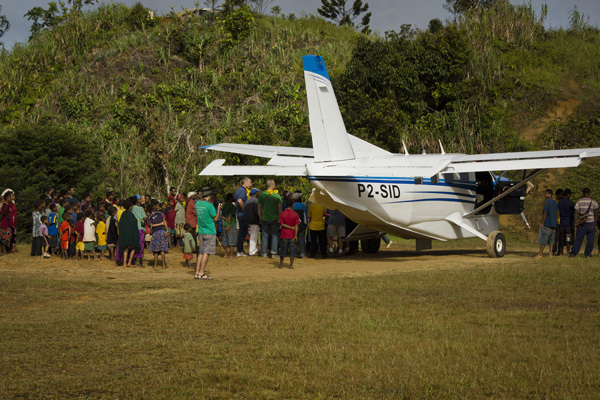 Pray for the language development workers and Bible translators who are working in Papua New Guinea that are experiencing cross-cultural blending. Pray that each will be willing to see the goodness of another culture. 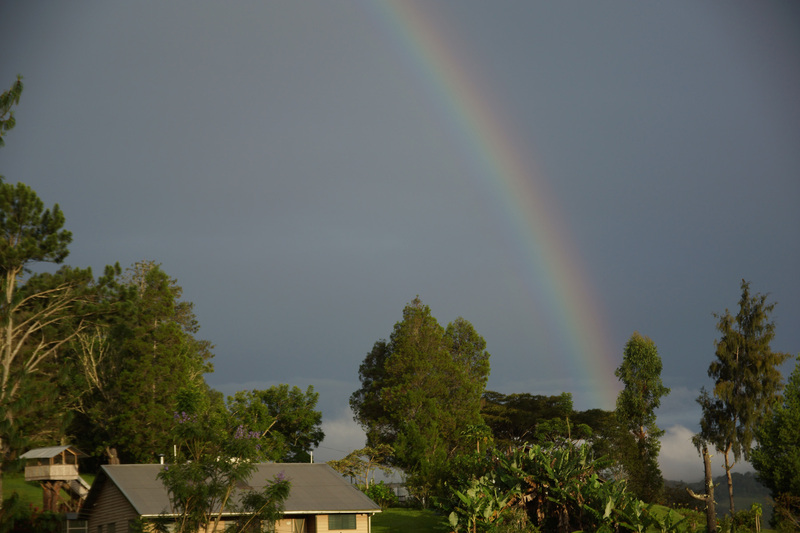 What’s at the end of the rainbow? In Papua New Guinea… it will most likely land on a different language group. Language development workers and Bible translators hope it will land on a language group where a translation project is already in process or completed – However, with over 830 languages and the need for almost 3oo new projects, this may not be the case. Each year the language development and Bible translation effort strives to meet that need. It needs your help. Pray for the many decisions that need to be made in order that a viable project can be started, maintained or restaffed. Pray for the needed resources to make it happen. The internet is a major tool in the language development and Bible translation effort. Language workers and Bible translators can communicate to the language groups when they can’t be physically present. They can even do it from overseas. However, it doesn’t come easily to remote areas of Papua New Guinea. Many advances have been made over the past several years and it is now possible to do much more at a lower cost but it still is challenging to keep the infrastructure working. 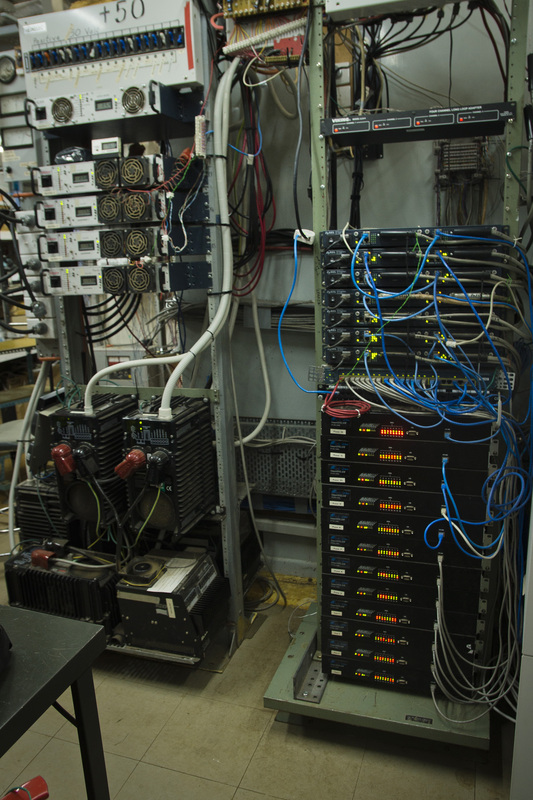 Pray for the experts that provide service to the PNG translation effort. Pray that they can diagnose problems quickly, provide cheaper and faster service and find creative ways to get the service to out-of-the-way places.